I’m sure that no one is stranger to that emergency carpet moment. Maybe it’s your new puppy, marking his or her territory across your formal living room. Maybe it’s your young ones newest obsession with cooking…and maybe using some questionable ingredients in the recipes. Maybe it was a raucous dinner party and that vintage Merlot somehow ended up all over your carpeted dining room floor. No matter what the instance, don’t shake your head in shame, there’s a very easy way to avoid these situations in the near future. That solution is STAINMASTER carpets. These carpets were born in 1987. Floors have been thanking them for it ever since. Their heritage is the idea that living rooms are actually for living, not just admiring the knick-knacks and precious furniture. Ever since the inception of STAINMASTER, the company has continued to elevate carpets as a technology and search for the newest evolution in design, to share. The first is versatility. You can easily compare carpet to the “little black dress” of flooring. It’s not only a necessity in your closet (or house), but it goes with absolutely everything. Any texture can work with carpet, and any color can work with carpet. It doesn’t matter if the aesthetic of your house is elegant and sophisticated, comfy or casual, carpet will complement all of the above. The next reason is comfort. There is absolutely no feeling like kicking off your shoes after a long day of work or play, and digging your toes into the soft fibers beneath you. It’s a spa-centric moment, one where you can completely decompress and exhale all of your worries. When you think of family evenings around the fire or snuggling on the couch, do cold hardwood floors come to mind? No, I can almost guarantee that you envision these happy, comfortable moments with carpet underneath your loved ones’ feet. The third reason is how easy they are to maintain. This is one that surprises many. You actually end up cleaning your carpets less frequently than wood floors. With both you need to vacuum but with wood flooring you also end up with the sweeping and the mopping. Wood flooring shows any and all flaws and will keep you on your hands and knees for hours that you should be enjoying with your family and friends. Meanwhile carpet, specifically STAINMASTER carpets only require regular vacuuming, prompt cleaning of any spills and a professional cleaning annually. That’s as often as you need to do your taxes, and much less painful. The next benefit may also surprise you. Although you may assume that wood flooring is what helps with allergies, it can actually cause them. Carpet doesn’t aggravate symptoms of asthma, as the dust particles are trapped by the carpet fibers beneath your feet, instead of allowing them to continue circulating through the air. All STAINMASTER carpets are made with INVISTA nylon fibres. These fibres are made with the most modern sustainability practices in mind, meaning you can live even more comfortably, knowing the impact that you’re having on the environment and the lack of impact that you’re having on your wallet. All being said, do yourself a favor and check out the wide variety of options of STAINMASTER carpets, available to you. 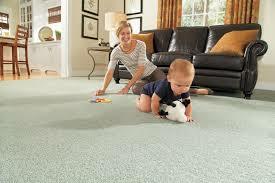 If you’re interested in learning more about STAINMASTER carpets for your home, call us on 03 9761 6572.